In doing genealogy I have had several encounters with people who are fiercely protective of information about their ancestors. They don’t want this or that picture on the web. They want this story taken down. They don’t want anyone to have a copy of certain documents, etc. They want the information kept just for them. They know, but they don’t want anyone else to know. Broadly, our ancestors do not belong to us. They belong to all those who will someday be born to their lines, generation after generation. They belong to history itself. It is not our job to keep information locked away where it will be lost eventually when we die. 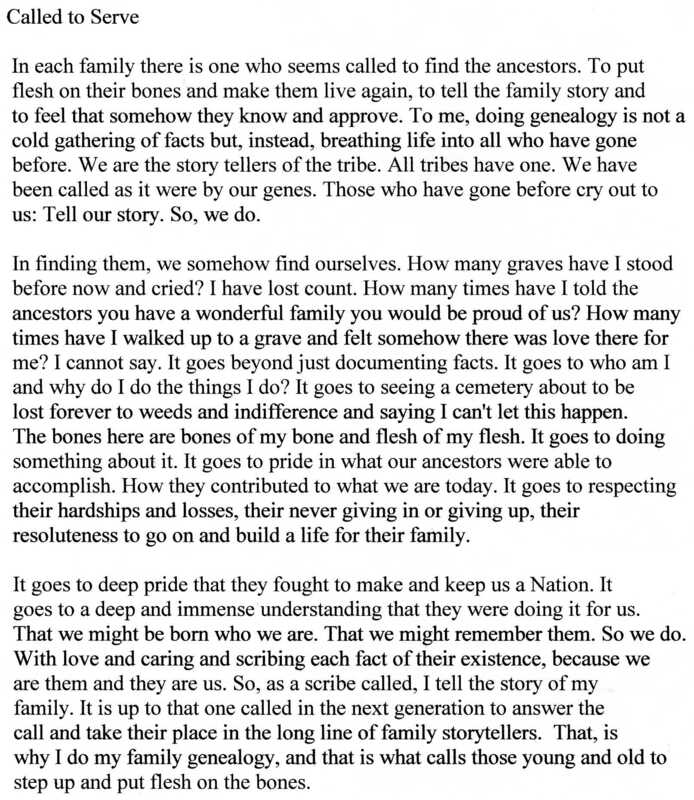 If we see things that way, eventually every one of the ancestors who gave us our genetics and the lives we know will be forgotten, dust, lost. People who feel like they should keep information about their ancestors secret and lock it away – people who think they *own* their ancestors – they are making it more likely that those ancestors will be forgotten. It makes me sad, because the loss is so much greater than just the loss of a person. It’s the loss of that person to every descendant who could have known them and, in doing so, known something of themselves. I’m a genealogist, which means I’m a historian… except I’m really self-centered about it. One of the key things about doing family research is that I try my hardest not to judge anyone for anything at all. I honestly believe everyone does the best they can do given their circumstances and genetics. That goes from the greatest heroes to the lowest of villains. When you do this research you overturn a lot of stones that have unpleasant things hiding under them. Suicide, murder, spousal abuse, drug and alcohol abuse, terrible parenting, etc. I don’t judge any of it. I wasn’t there and I don’t know their circumstances. I see it as my role to document what I can, and to that degree I honestly try to embrace the “whole person”. The good and the bad, the mundane and the extraordinary. I make every effort not to “whitewash” the past [although interacting with living relatives can make this difficult since they often want less-than-flattering details omitted]. I try to present the facts as I find them, and try to understand these people as thoroughly I can to the extent that it’s possible. I’m grateful beyond words to have the help of my extended network of living relatives who knew my ancestors and can help me know the “whole person” in a way that census records, marriage documents, and gravestones never could. I hope I can be forgiven for a small meta-comment this morning. My cousin Jeannie sent me this, and it does such a good job of summing up the passion for genealogy that I had to share it. I wanted to put this up here to remind myself and others why we do this crazy thing.